How do I upload records to TrueNCOA for NCOA processing? Check out our Input File Guide! 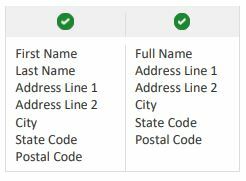 We encourage users to include as much information on their upload file as possible, including: Individual ID, Address ID, Address 2, and Postal Code. Please note: We recommend a minimum of 100 records uploaded. TrueNCOA will accept CSV (comma-separated values), with either TAB or COMMA as the delimiter, and Excel (xls) files for upload. These files can be imported one of three ways: Copy/Paste, Drag/Drop, or File Browsing. - WHAT IS A CSV FILE? A Comma-Separated Value (CSV) File is a simple file format used to store tabular data, such as a spreadsheet or database. A CSV file, as it's name states, is created by adding commas to separate the data. View a CSV file. CSV files can be created in Excel by saving the table and changing the 'Save as Type' to CSV (Comma Delimited). - WHAT IS A TAB DELIMITED FILE? A Tab Delimited File is, also, a simple text format for storing data in a tabular structure, such as a spreadsheet or database. This type of file is created by adding tabs between data fields. View a Tab Delimited file. Tab Delimited files can be created in Excel by saving the table and changing the 'Save as Type' to Text (tab delimited). - WHAT IS AN EXCEL FILE?